We were sitting at the Lake Monroe boat ramp in Deltona this morning (waiting for the rocket launch) when a guy parks behind us and proceeds to walk from his car onto the floating dock holding a gopher tortoise! It took me a second to realize what he was about to do and I quickly yelled at him to STOP! I ran over to the dock and the man explained that he found the animal in the middle of the road and was going to ‘help’ it by dropping it in the water. Facepalm! I explained that he was holding a gopher tortoise, that this is a land animal and that it would drown if he dropped it in the water. The man backed up and went to release the poor tortoise behind the picnic tables and then left. Is this a common thing? Are there many people picking up gopher tortoises from roads across the state to then go to the nearest lake and drop them in the water, thinking that they’ve done the creature a huge favor by saving it from certain death on the road? I shudder to think of how often this happens. Standing there on the dock watching the rocket launch I had this horrible picture in my head of hundreds of tortoise shells laying around me at the bottom of the lake. Back home behind the computer I found many news stories from last month about the FWC urging people to stop putting baby gopher tortoises in the ocean. Apparently people were misidentifying them as baby sea turtles and there were several reports of wannabe good Samaritans releasing the hatchlings into the sea. Doh! 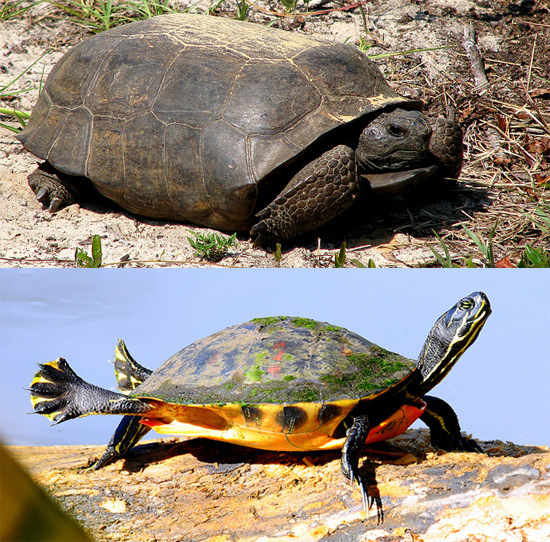 No wonder these animals are endangered if people can’t even tell them apart from turtles. A couple of years ago we were at a very swampy park when a guy got out of his car holding a gopher tortoise that he had found a few miles down the road. He was about to release it there in the swamp, thinking that it would be a much safer place than the busy road he had found it at. Of course, in reality the tortoise was yanked from his home territory, where it had made its burrows and had perhaps lived for decades until this person brought it to a park miles from his home with inappropriate habitat where the tortoise might not even be able to ever make a burrow again. We have on numerous occasions seen gopher tortoises in parks where we think the habitat isn’t quite right, making us wonder if someone dropped them there. What are people thinking? If you see an uninjured turtle or tortoise on the road you can best bring it to the side in the direction it was headed. See this page for more tips. Leave it in its home territory and don’t drive it miles to a park that may not have the right habitat. Chances are it is already quite old and has been doing fine where it is. Of course, if you really think the gopher tortoise is in the wrong place or in a very dangerous place, you should call Florida Fish and Wildlife. Injured tortoises and turtles should be taken to your local wildlife rehabilitators (see this list of facilities in Florida).